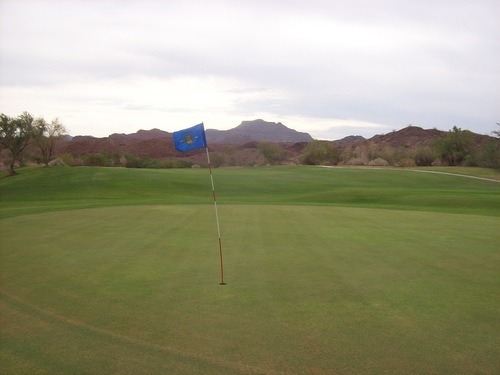 I told you about the two rounds I played Saturday morning in Lake Havasu, but obviously I still had a lot of daylight left to squeeze in a third round in the afternoon. 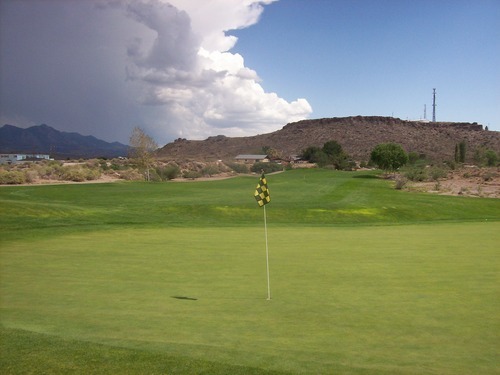 Heck, I had more than enough time to play a fourth, but I thought better of it amidst the summer weather in the desert. 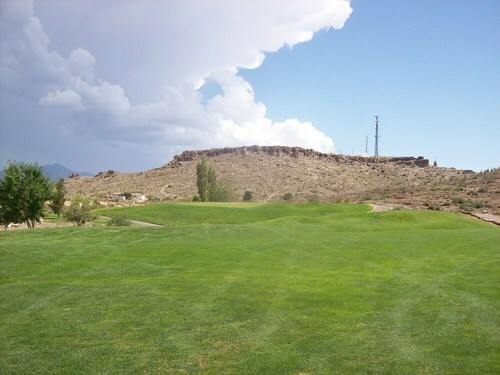 Ultimately, I was deciding between El Rio up in Fort Mohave (near Laughlin/Bullhead City) or Cerbat Cliffs in Kingman. Both are about an hour away from Havasu. I called El Rio first just to get some information, but I got a recorded voice message saying that they have limited summer hours. They take tee times from 6-10am daily and then the pro shop closes at 2pm. Clearly not an ideal situation for an afternoon round. Either way, I was intrigued and there weren’t many other worthy options to consider, so I hit the road and drove northeast toward Kingman. 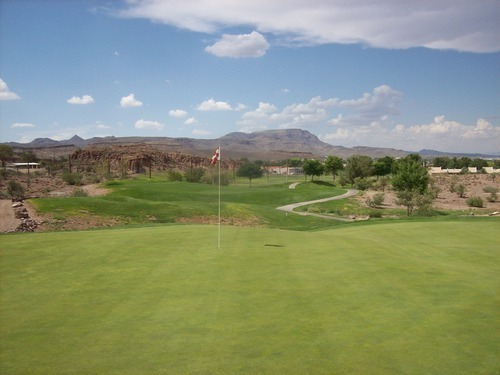 The course is just off the I-40 freeway and you can see several holes as you drive by. On a positive note, I could see things were quite lush and green (that guy was being genuine). On the negative side, I saw a lot of people out on the course, including one group that was clearly a sixsome. For my third round of the day on a warm afternoon (especially when both early rounds went so quickly), I wasn’t too excited about the possibility of slow play. But I was there, and I felt committed to it no matter what. Fortunately, that turned out to be a big shotgun tournament that was just about to finish up. 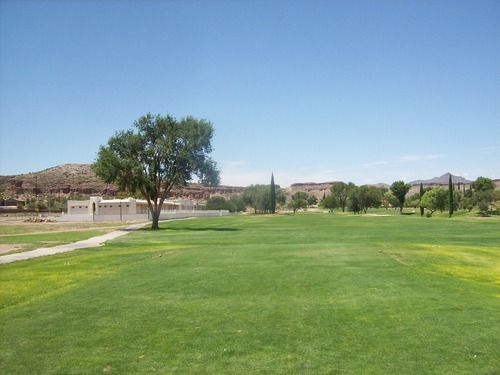 So by the time I checked in and headed out to the first tee, the course was almost all mine. I did pass one group on the front nine and ran into some groups on the final few holes, but otherwise it was smooth sailing. 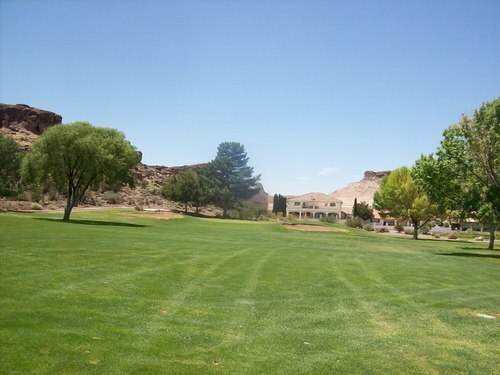 It was sunny, but windy and reasonably cool on the front nine. By the time I had made the turn, though, a really ugly looking storm had formed over the nearby mountains. It was one giant black cloud and the white edges of it were starting to hover over the course a little. I could hear the rumbles of thunder, see the sheets of rain and even caught a few bolts of lightning in the distance. It looked sketchy and I really hoped it wasn’t coming my way. Luckily, it seemed to be moving slowly but surely to the northeast and never threatened my round, but you’ll see how nasty it looked in some of the pictures. 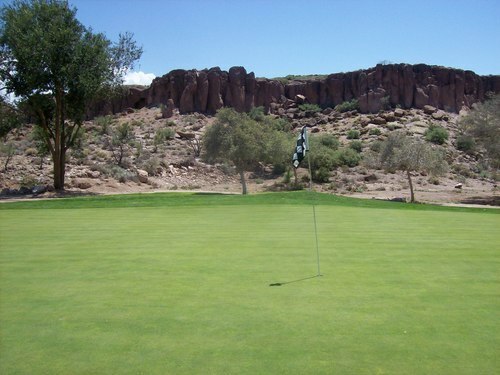 Regarding the course, Cerbat Cliffs was a very pleasant surprise. 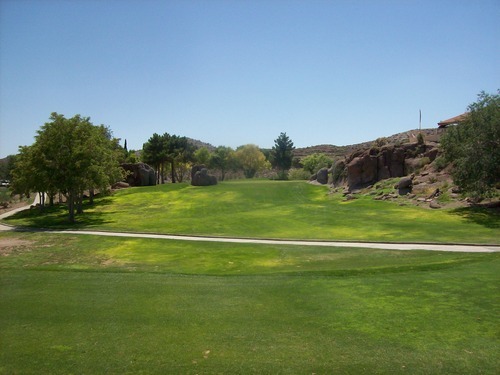 The vibe around here is pretty casual with the locals, but the course is in a really cool setting amongst unusual boulder outcroppings and distinctive rock formations. 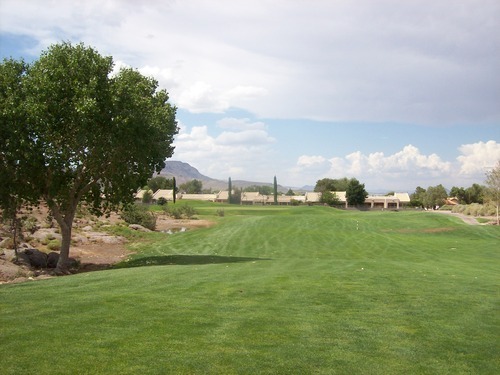 Though there aren’t too many elevations changes on the course itself, the surrounding hills and rugged desert landscape offer a great scenic look. The actual layout is solid, but probably pales a bit in comparison to the setting itself. 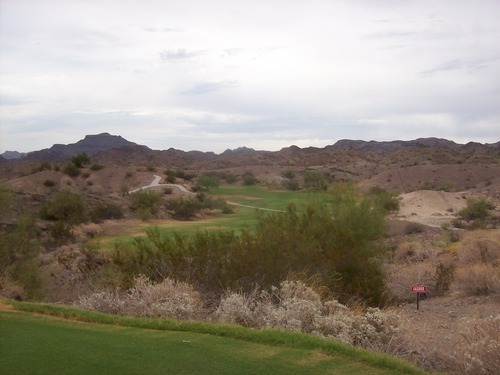 There’s a good diversity of holes and enough challenge to keep you engaged. 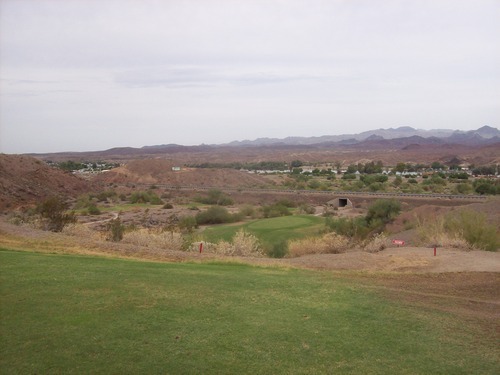 The holes along the freeway can be a little distracting, but that area also offers some nice unobstructed views of the mountains in the distance. 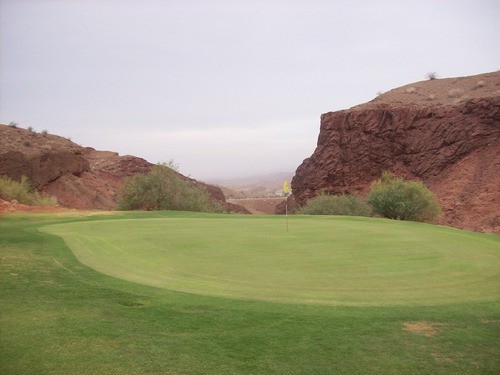 There are definitely some memorable holes at Cerbat. One is the signature par-3 8th. 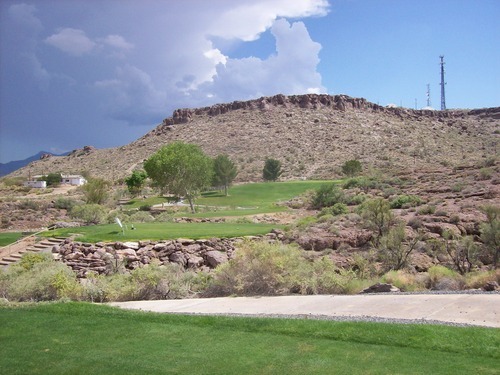 In actuality, it’s a pretty straightforward design, but the green is set amongst some giant rock outcroppings and it’s a very distinctive look that interacts directly with the unique natural elements around the course. The finishing stretch of 16-18 (but mostly 16 and 17) are kind of a departure from the rest of the course. 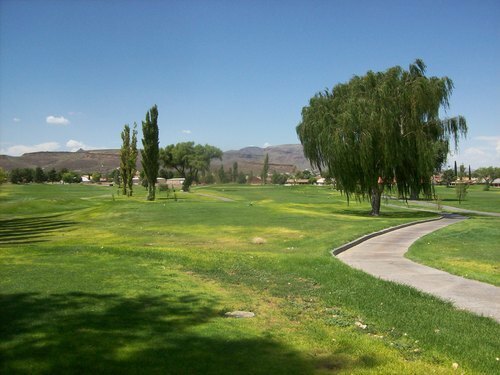 They are set apart, across the road on the other side of the driving range and offer a little more dynamic design style going back into a little canyon. 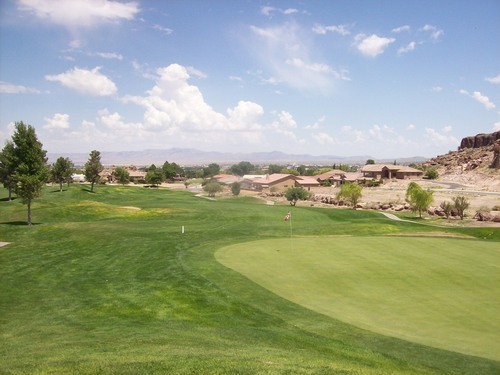 The 16th is a difficult dogleg left par-4 with an uphill approach. 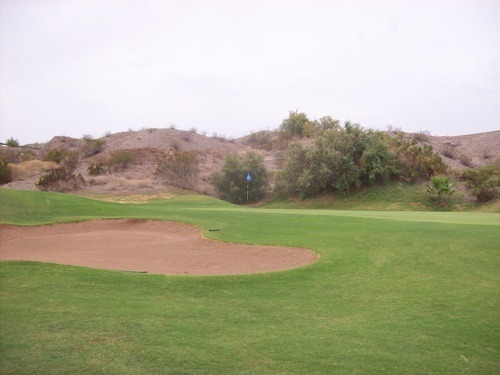 The green stands out on this hole because it is multi-tiered with some pretty significant undulation, whereas the rest of the course’s greens aren’t so dramatic. 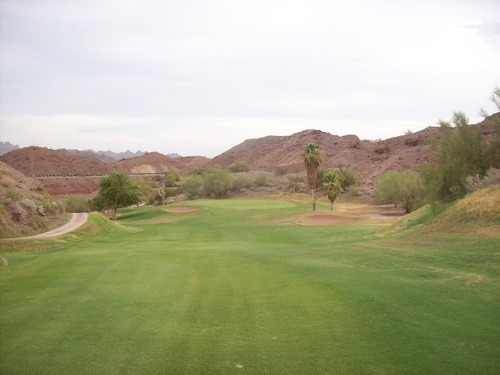 The 17th is a great par-3 also surrounded by the rugged desert terrain, leaving not a lot of room for error. For this time of year, I would have to agree with the bold pro shop guy and say Cerbat Cliffs is in pretty “awesome” shape right now. 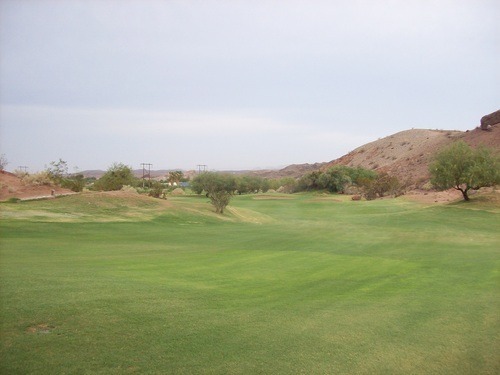 I was shocked at how lush and green things were and didn’t expect to see thick rye fairways and rough on a desert course this type of year. The only drawback is that they keep it a little extra shaggy (which is understandable with the heat), so there is no roll-out on drives and it can be a little sticky when hitting from it. 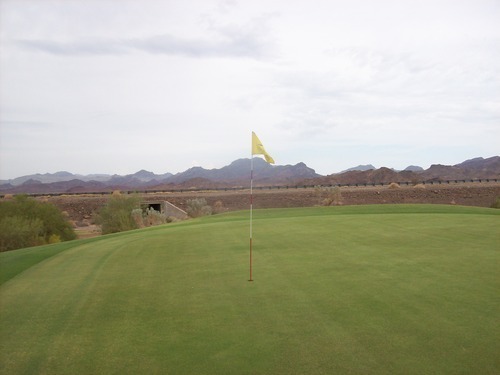 There were some weak patches here and there, but it was mostly very nice looking and consistent in its playability. 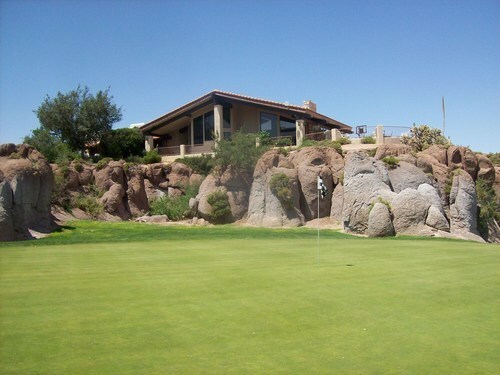 The bunkers were good, but did have some rocks and pebbles in them. The greens were also soft and receptive, but not too beat up despite the big tournament group earlier. It seems they were being good golf samaritans and cleaning up after themselves, which is always good to see.. 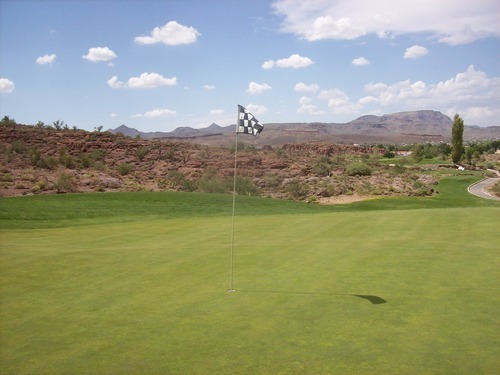 The greens rolled smooth on putts at medium speeds. Is Cerbat Cliffs worth driving an hour or more out of your way just to play it? 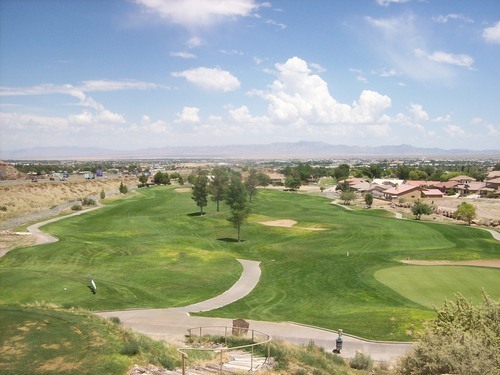 Probably not, but it’s a surprisingly good course in an area where there isn’t much to choose from. 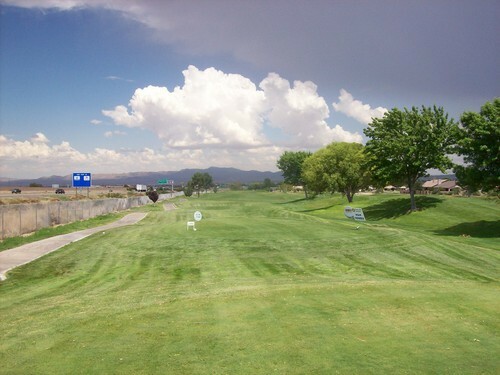 If you are driving along the I-40 on the way between California and Flagstaff, then this is the place to stop and scratch your golf itch. 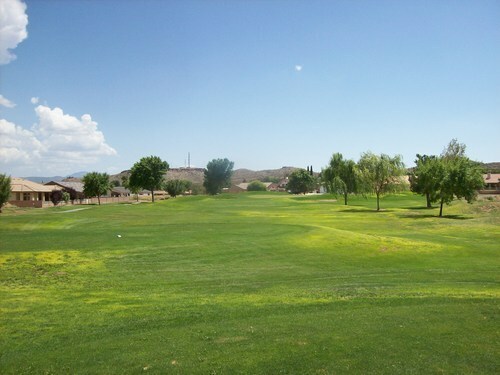 After finishing in Kingman, I headed back down to Lake Havasu to spend the night. As I mentioned in the last article, I am glad I didn’t end up playing later in the day here because it got so dreadfully hot by the late afternoon. After dinner, I walked around the little area underneath London Bridge. 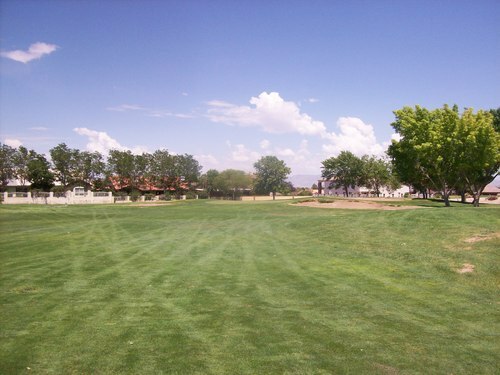 I was probably out there for no more than 20 minutes and that took way more out of me than three rounds of golf did. It was brutal! Speaking of dinner, I stopped at Casa Serrano Mexican Restaurant. 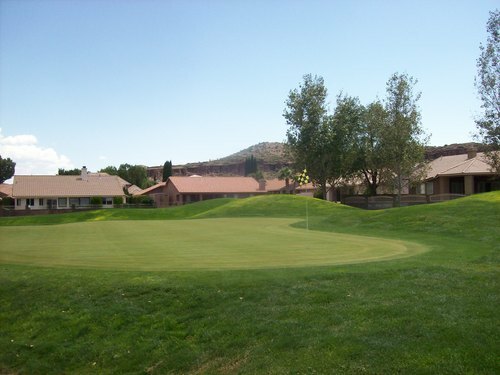 This is a small chain with locations throughout the Colorado River area. I ate at one earlier this year while in Fort Mohave and really liked it, so I was excited to see there was one in Havasu, too. They have a really diverse menu (build your own combination with a ton of items to choose from) and I love the bean dip they give you with your chips and salsa. Also, the real secret weapon is the special sour cream you can get on the side which is mixed with onions and is just plain delicious on everything. This course was one of the main reasons for this little trip. 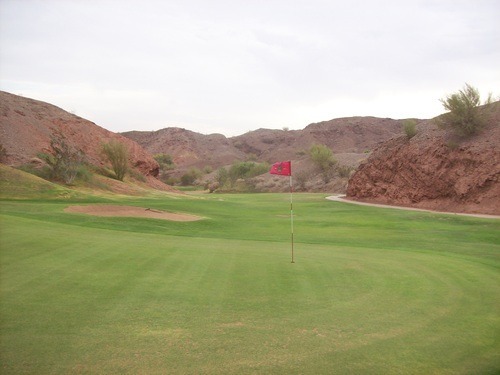 I didn’t really have any significant expectations with the Havasu courses or even Cerbat Cliffs, but I have always heard nice things about Emerald Canyon. 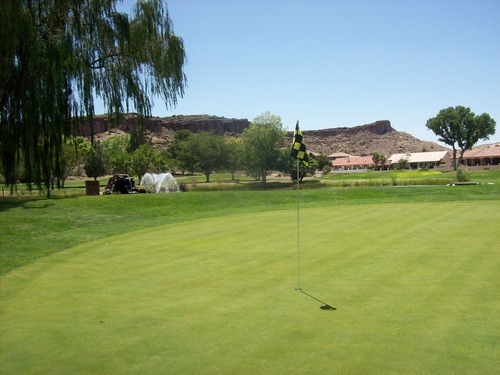 Parker is about a half-hour south of Lake Havasu City, so it’s definitely in an out-of-the-way spot that doesn’t really make sense to visit unless you are on the way to or from Havasu. 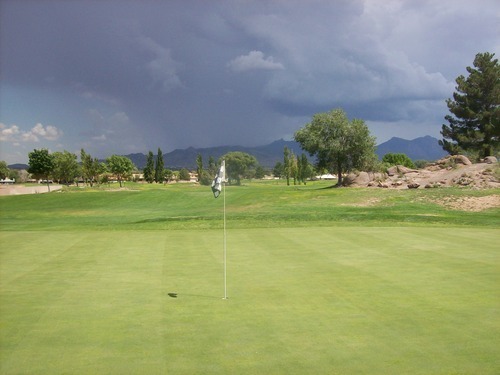 As I was driving down early in the morning, I did see some storms over the nearby hills and mountains, so again I was hoping thunder and lightning wouldn’t be a problem when I got to the course. When I arrived at Emerald Canyon, the sky was overcast and there was a little wind, but it was obviously not storm weather. There were some people already out there when I arrived around 5:45, but there was no problem in getting out quickly. The price was $39.75, which is very reasonable for a weekend morning in the summer. The starter sent me right out to the first tee to join another twosome. Right as one of the guys was teed up and about to hit his drive, we all were drawn to look behind us. There we saw a creepy brown wall of dust and sand coming over the canyon and swiftly in our direction. Sandstorm! 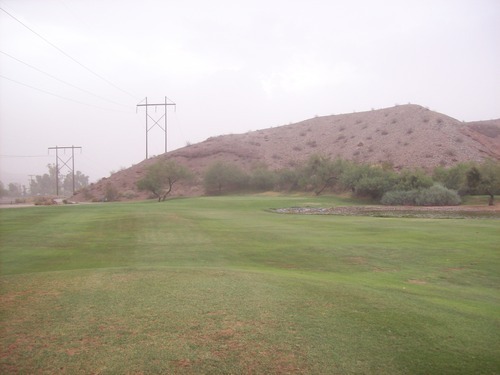 Wisely, we jumped back in our carts and drove up to the clubhouse to hunker down while the worst of it rolled through. It was pretty rough for a few minutes with really heavy winds and all the sand flying through. 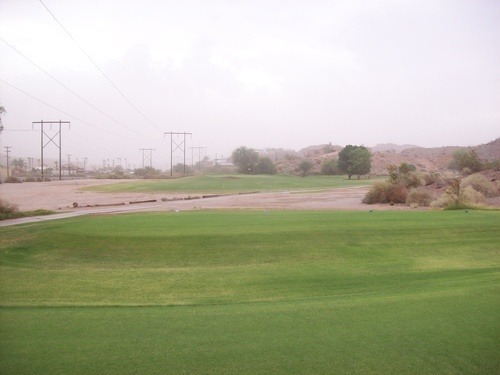 By about 20 minutes, though, the really bad stuff had passed and we went back out to the course to start over. It remained quite windy and a little dusty all round, but we managed just fine. One of the guys left after nine holes, but me and the other guy finished all 18 in about a three-hour pace. 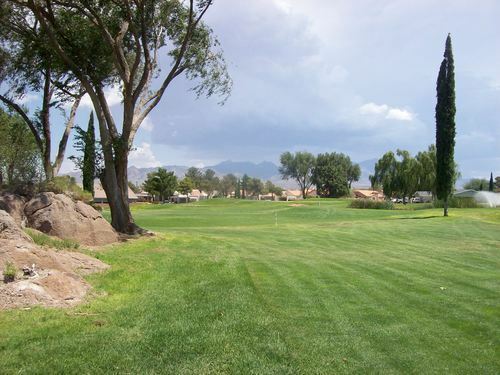 It worked out well as I avoided the temptation to play any more golf when going through the Coachella Valley. I got home at a reasonable hour to rest and relax a bit before getting back to the drudgery of the work week on Monday. On most every level, Emerald Canyon lived up to my positive expectations. 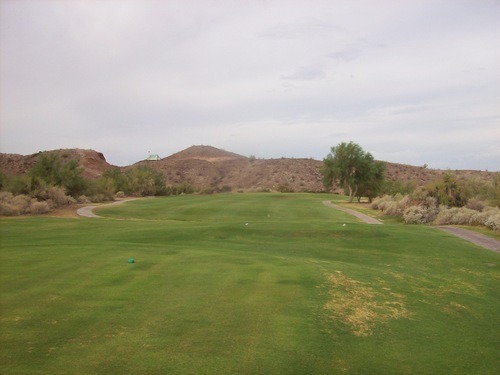 This is a really fun course in a neat desert canyon setting. 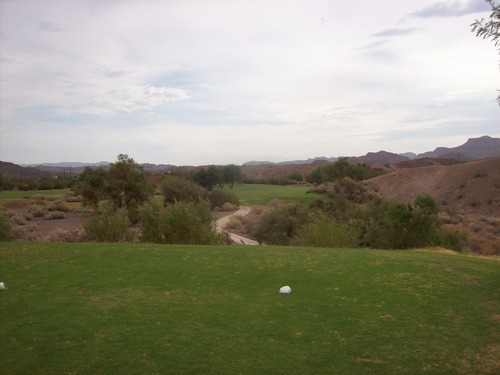 The layout is not for the faint of heart, as it takes the idea of “target” golf to the extreme on a number of holes. Both nines start off with a few fairly benign and flat holes down in the valley before turning into the hills, where the real fun and excitement begin. The guys I played with called holes 4-6 the “Triangle” and it seemed they were just happy to survive that stretch without major damage. The 4th is a short, but nasty little par-4 with a very narrow tee shot. 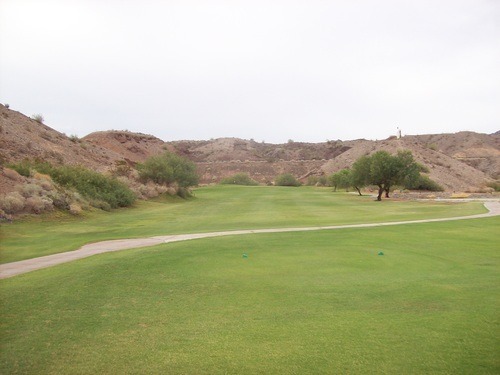 The fairway snakes between two canyon walls, but if you hit a safe tee shot it’s a pretty easy hole from there. 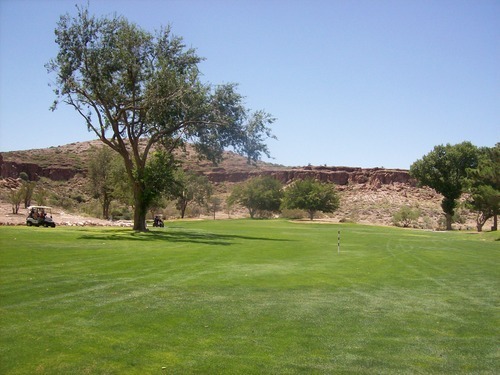 That’s the case on many of the canyon holes here. 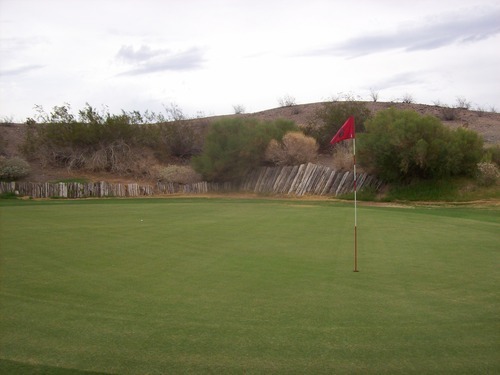 Play it safe off the tee and you can score well from there because the greens aren’t too hard to get at. 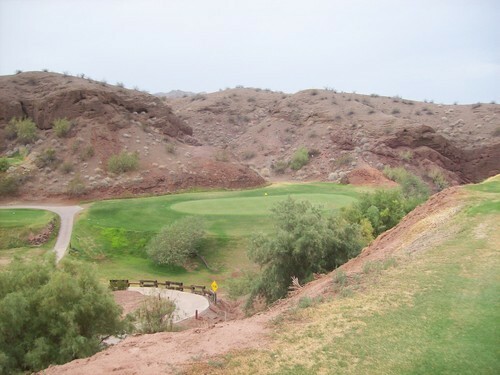 The 5th is a short and fun par-3 set back in a canyon with a downhill shot, so it’s mainly about judging the distance factoring in the elevation, the pin location and any wind that’s in play. The 6th is a really tough par-4 with a semi-blind tee shot to a fairway that’s not quite as narrow as it looks, but it still pretty tight. 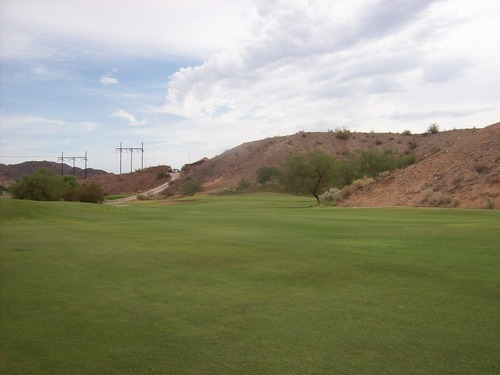 There are a few par-4 holes that can be drivable for long hitters (and even average hitters depending on the wind and which tees you play). The 4th is one of those, along with the 7th and the 16th. A couple of the par-5s are also easily reachable, too, so there are some good risk/reward options because if you do go for a green and miss it, you are likely in big trouble. Probably the other big story of Emerald Canyon is the ever-present threat of snakes. 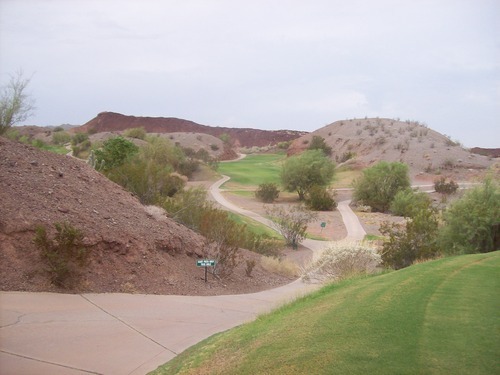 That is true on most any desert/canyon course throughout the Southwest, but I’ve never heard so many snake stories as I did here. 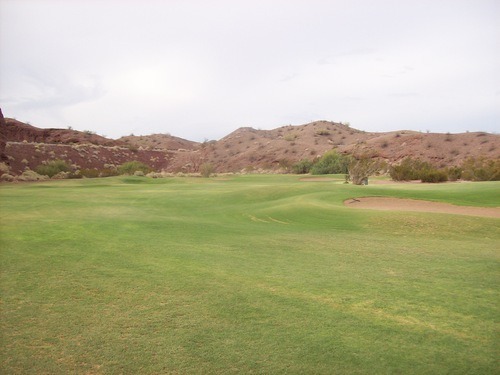 One of the guys I played with is a longtime member here and just about every hole, he pointed out where there was a sighting or encounter with a rattlesnake, including a few actual biting incidents that required emergency services. Throughout the round, my interest in this subject was especially piqued. In all my years of playing golf on courses where rattlesnakes are a threat, I have never seen one. Now don’t get me wrong, I’ve never wanted to have an up close and personal encounter, but I just have always kind of wanted to see one. That finally happened by the 15th green, when he pointed out some of the little holes in the rock walls where they liked to sleep. We peeked in one and there it was all tucked in. It wasn’t a great view and not good enough for a picture, but at least I can say I finally saw one on a course! Emerald Canyon was also in pretty good summer shape. It was far from pristine, but looking decent and playing nicely. The tee boxes were good. 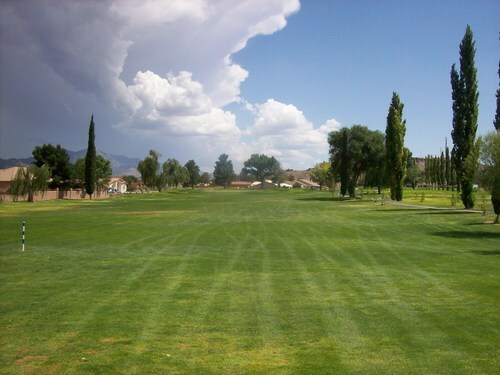 The fairways had nice bermuda with occasional thin spots. There really isn’t much in the way of rough here. 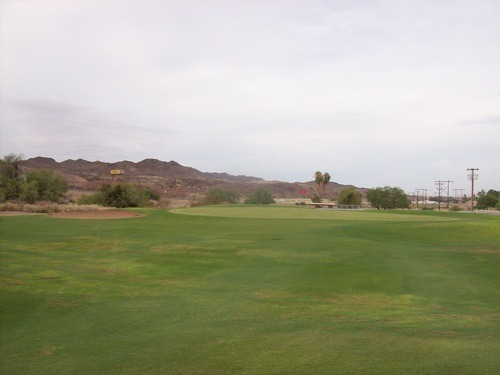 There are some parts around the greens, but for the most part it’s all just one fairway cut up to the edges and then it just kind of blends into the desert and native areas. Those transitional edge sections generally weren’t too great to hit from, but the middle of fairways were almost always nice. I was in just one bunker and it had good sand. The greens have completely recovered from any aeration that was done recently. No signs remain. 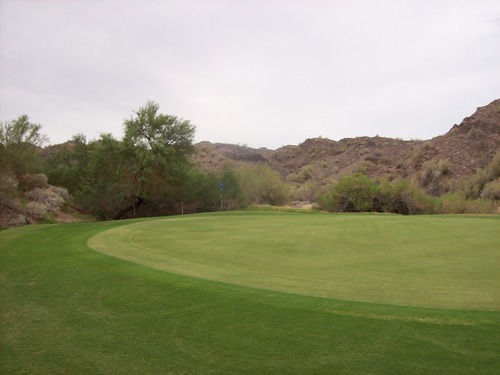 They were firm and relatively slow (as is typical on desert courses in summer), but had smooth surfaces for a consistent roll. Overall, I found Emerald Canyon to be very enjoyable and would definitely recommend it if driving through Parker for whatever reason. 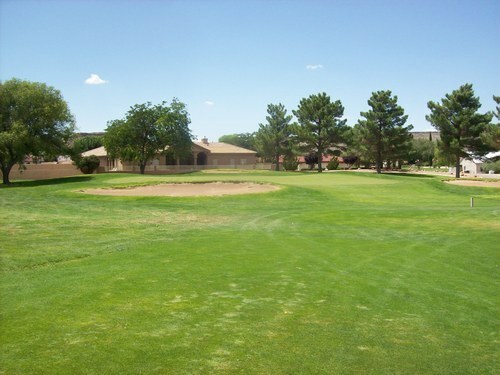 I wouldn’t put it on the same level as what you’ll find in Scottsdale and other parts of the Phoenix area, but for the western part of Arizona, it’s definitely one of the best options.